Now that the Broadway season has come to a close, summer is a a time for traveling off the Great White Way and exploring some riskier theater. Stage Rush is giving readers a head start by giving away a pair of tickets to the newest production from one of the most daring theater companies around—The Amoralists. 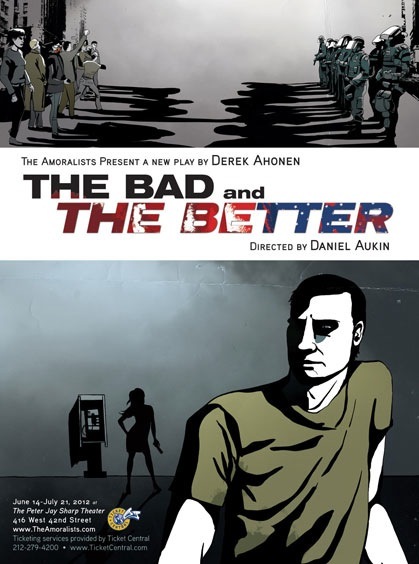 A new play by Derek Ahonen, The Bad and the Better is a detective noir set in modern day New York in which political corruption leads to a street war between anarchists and the local government. The play, directed by 4,000 Miles‘ Daniel Aukin, begins performances on June 14 at the Peter Jay Sharp Theater and runs through July 21, and Stage Rush is setting one winner up with a pair of tickets. Answer the questions below to be entered into the contest. The giveaway will end on Thursday, June 14. Winner will be contacted via email and must acknowledge acceptance of the tickets within 24 hours of being contacted, otherwise a new winner will be chosen. The tickets are valid for all performances in June . The tickets are not available for resale. What are you waiting for, Rushers? Enter to win tickets to this hot show! And don’t forget to follow Stage Rush on Facebook and Twitter, and sign up for the weekly newsletter! Tickets are provided by The Amoralists.